Feminine Lost relays on the inner male-female paradigm, an ancient assumption that we have both male and female essence inside of us independently of sexual orientation. The imbalance of these energies in us creates inharmony in ourselves and our relationships nowadays. Through her own experience and her clients, transformational coach, Jennifer Granger explains with archetypes how these imbalances, promoted by false beliefs, show up in our society, specifically the ones where women tend to their masculine essence and men, in consequence, to their feminine essence. You attract your inner polarity, and the energy imbalance ensures dissatisfaction, and an unease feeling persists until the pursue of equilibrium. 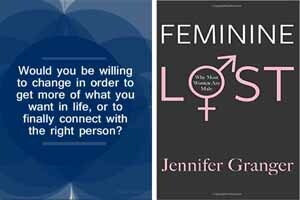 Feminine Lost is useful for both men and women to embrace a healthy male-female relationship in us and through us at work, and at home.